Online-store "Inksystem.com" has been launched after numerous requests from our customers to show online and to describe consumables for inkjet printing that we offer. Nowadays online-store is one of the best places to learn more about Continuous Ink Supply Systems (CISS), and to order any necessary consumable for your printing device. International industrial-trading company "INKSYSTEM" specialises in manufacturing and sales of all kinds of consumables for inkjet printing. The company has more than 200 dealers and offices in several countries of the world. Mission of the company is to give an opportunity to any person and to any company to use their color printer, all-in-one or plotter regardless of the cost of ink and to have the same or even better quality of prints than using original cartridges. 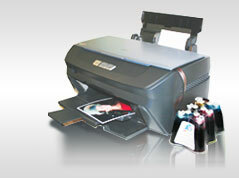 Company offers full range of products for inkjet printing. These are the best goods that were selected by our customers all over the world during many years of our work. There is a short description of each group of goods. All materials are compatible with each other and created to provide excellent color reference results with affordable cost for each image. It is the device to decrease the cost of inkjet printing by 30 times compared to original cartridges (1:30 price comparison). It is very simple to install and to use CISS. CISS consists of three parts: cartridges, the same as original ones, external ink tanks which contain ink, and ink tube that lets ink of each color pass from ink tanks to ink cartridges. Dye-based ink (photo ink) - is popular to make price-affordable and high-quality images, text and photographs. Pigment ink - is used for 4-colour printers and images that should have water resistance. Ultrachrome ink - is used by professionals in 8- or 10-colour printers for superior quality, usually is twice as expensive as dye-based ink. Sublimation ink - mostly bought for printing on thick surfaces: cups, t-shirts, etc. Matte, and glossy, of different sizes, density and thickness, especially developed to suit INKSYSTEM ® ink. Everything else for inkjet printing. INKSYSTEM also offers actual printing devices from their manufacturers, with already pre-installed continuous ink supply systems. These products are manufactured in factories in South Korea with modern hi-tech equipment. Usually the difference in quality of printing results is 3-5% that can be recognized only by professional photographers after an intensive examination. For excellent-quality results of home and office printing it is enough to use dye-based ink from INKSYSTEM, we can prove it by tens of thousands of users who print with INKSYSTEM ® consumables in different parts of the world. For those who wish to have superior quality and vivid images, INKSYSTEM Corp. offers the unique opportunity to create an individual ICC-profile for your printer model. ICC-profile is a driver that manages color reference of your printer for certain ink and paper. It could be standard for the model of printer, or individual for the exact printer (e-may). Printer manufacturers offer standard ICC-profile for their ink and photo paper. You select one of them whilst choosing these parametres when clicking on a type of ink and paper in printer settings. Moreover, our experts can offer an individual ICC-profile for your printer. As there are no absolutely identical people in the world, there are also no two identical printers and printing heads. So individual ICC-profile will best fit to that exact printing head, and will give an image that couldn't be made with the help of a standard ICC-profile and original cartridges. If you want to order an individual ICC-profile to get superior printing resualts, please contact us via office@inksystem.com to find out the exact price and terms for its creation. Each dealer or each company office has their own stock, the exact availability of the product in the nearest office can be simply checked by contacting them. If you don't have necessary goods in your country, we will send them from the nearest office. The cost of printing using consumables from INKSYSTEM is 30 times lower compared to original cartridges. You save 95% of your money on every page you print. Every page. 95% percent. Feel free to contact us to obtain wholesale discounts, as well as signifficant support from the central office to start or to develop your business with INKSYSTEM ®. Details are on the "Contacts" page.